Corporations are putting our lives and our environment at risk through a growing and improper influence over institutions, whose responsibility should be, instead, protecting people and the planet. What is increasingly clear to all is the impact of their “busyness” on our lives – an environment that is increasingly polluted and toxic, bad quality and unhealthy food, and an increase in disease, all of which too often aren’t directly linked to these companies and the consequences of their policies in the public debate. Evidence of the toxic consequences of the policies of these mega corporations, which we call the Poison Cartel, is growing by the day – insects are disappearing, small farmers are losing their livelihoods, rural populations are being driven from their land to make way for industrial agriculture, biodiversity is fast disappearing to make way for monocultures, and consumers increasingly have no option other than to buy toxic food grown in increasingly contaminated, chemical infested soils. Over the last decades these companies – which produced lethal poisons during the two world wars – turned to the agricultural market, where they saw enormous potential to keep multiplying their profits. These corporations liberally spread agrochemical poisons wherever they can, wiping out millions of species, destroying our ecosystems, poisoning the entire web of life. This is a trend that has to be reversed as we’re also talking about a failed technology. US farmer fields have been witnessing the uncontrolled spread of “superweeds” like amaranth, especially in the south-eastern states, where approximately 92 per cent of RoundUp Ready cotton and soybeans are infested. As a consequence, farmers have started to increase the use of pesticides. One of the myths about safe pesticides is that “pesticides are rigorously tested”. Besides the fact that only a few hundred of the 80,000 chemicals used in US are tested for safety (USPCP), regulatory agencies only test the active substance of individual pesticides based on the indication provided by the manufacturers, avoiding to investigate either the toxicological risk of the product as a whole (complete with co-adjuvants and co-formulants) or in combination with the overall mix of pesticides available on the market and often simultaneously used in fields and gardens. In a context where the world’s agriculture and food systems are being hijacked by a handful of corporations, regardless of the impact on ecosystems, climate, people’s health and farmers’ livelihoods, Navdanya has focused its work for a paradigm shift towards a different food and agriculture model, which respects the Earth as a living, self-regulating system and the creativity and intelligence of all species and of us humans as Earth Citizens. Navdanya International’s research, campaign and movement building for Poison Free Food and farming 2030 is bringing together citizens and farmers movements that practice and promote biodiversity based organic food and agriculture systems, which, while providing food and nutrition, are at the same time providing solutions to the climate crisis, helping to halt the current march towards the sixth mass extinction, and have the power to make Big Ag and Big Food irrelevant. 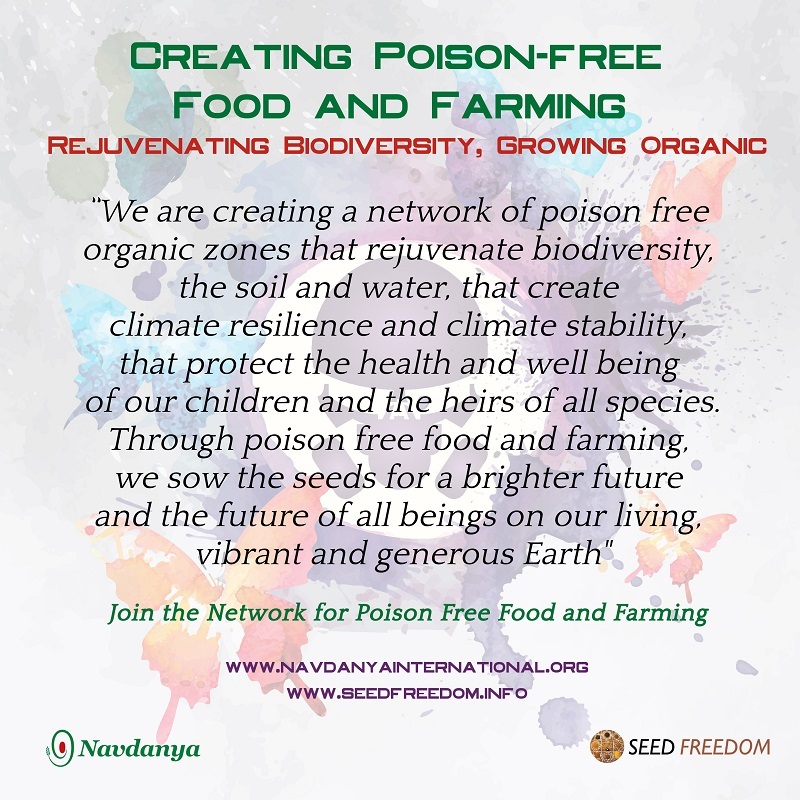 Navdanya’s Manifesto on Food for Health aims at highlighting the inseparable link between food and health, developing comprehensive strategies in synergy with different stakeholders, to overcome the model of industrial agriculture, encouraging the convergence and action of the movement for Agroecology and Public Health movements to reach a common vision of sustainable development, which must be equitable and inclusive. Navdanya International’s reports “The Toxic Story of Roundup: Freedom from the Poison Cartel through agroecology” and “Il Veleno è servito: glifosato e altri veleni dai campi alla tavola” (Poisons in Our Plate: Glyphosate and other poisons, from field to table), describe the origins and growth of the Poison Cartel and the ways in which giant agri-business companies gain and keep control of their empires in collusion with governmental agencies, while also making evident the lack of national and international regulations necessary for the protection of our health and our environment. They also highlight the way civil society movements are fighting back all over the word, as well as how the only possible response to the present ecological and climate crisis, poverty, malnutrition and health emergencies is through biodiversity-based agroecology, a toxic-free, harmless and vibrant agriculture, free of fossil fuels and poisons, and by redirecting economic interests from the present linear, extractive and industrial paradigm to a regenerative ecological and nature-based circular approach. Navdanya International’s work on movement building, along with multiple civil society organizations, which converged at the Monsanto Tribunal and the People’s Assembly in October 2016, brought out the evidence on the dangers and impacts of pesticides, particularly glyphosate based herbicides, such as RoundUp. Navdanya International was among the initiators of the Europe-wide movement to Stop Glyphosate and, in 2017, it was part of the coalition which initiated the European Citizen’s Initiative to Stop Glyphosate, reform EU procedures for the approval of pesticides and promote a new model of agriculture based on ecological methods. By June 15th, 2017, the goal of collecting more than one million signatures in seven EU member states was reached . In spite of strong opposition from civil society, in November 2017, the EU Appeal Committee – consisting of experts from the EU member states and the European Commission – approved the renewal of glyphosate license for 5 years. The long and controversial process preceding this decision has highlighted the pressure received by European decision-makers from large agrochemical groups, as well as the strategies implemented by industry to keep its products on the market: from lobbying to interference in government agency processes, to mega mergers and acquisitions, to attacks on independent science in collusion with institutions. This has been amply illustrated by some investigations, such as Monsanto Papers and Poison Papers, where, in addition to clear cases of corruption, there is evidence of collusion between industry, regulatory agencies and several members of the scientific community. In view of the hundreds of independent scientific studies published which have exposed the disastrous impact of glyphosate herbicides on human health and the environment, it is evident that the European vote has ignored the precautionary principle and that European member states representatives have missed a huge opportunity of asserting their role and responsibility as defenders of citizens’ will against the interests of large corporations. On 1st October 2017, in New Delhi, India, Navdanya brought together communities from the Alps, represented by Ulrich Veith, Mayor of the pesticide-free village of Mals in Northern Italy, and communties from the Himalaya that are chemical free, to pledge to use the gifts of nature and their shared knowledge and culture, for a world free of poisons – thereby taking a pledge on Poison free Communities for each one of us to be part of a Global Network of Poison Free Organic Zones. In 2018 Navdanya International joined Citizens for Science in Pesticide Regulation, the coalition of over 110 Civil Society Organisations calling for a more rigorous implementation of EU standards in pesticides regulation. Policy advocacy actions are planned to take place in October 2018 at the EU level. So, what are the possible solutions? These are coming from the bottom rung. All over the world small farmers and gardeners are already implementing biodiverse ecological agriculture, while rejuvenating the soil and saving and breeding their seeds. They are providing healthy and nutritious food to their communities and bringing back food in the hands of farmers and consumers, making big agribusiness irrelevant and useless, along with their poisons and toxic food. 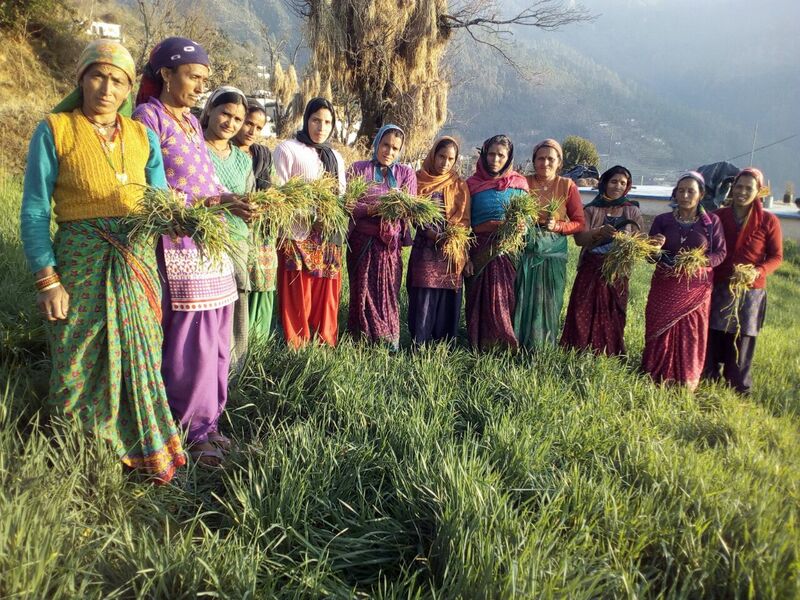 And as Navdanya’s work over the last three decades has shown we can grow enough nutrition for two times the current population, we can increase farmers’ incomes tenfold by giving up buying toxic chemicals, we can address malnutrition and chronic diseases, and we can create climate resilience.